Victoria, Mahe (Seychelles) – April 10, 2018 (travelindex.com) – Many loyal and hard-working Air Seychelles staff are now finding themselves entering the country’s “unemployed list” after years of dedicated service to the National Airline. These young Seychellois have little option but to abandon their chosen careers in the field. Most of those being laid off are looking to the tourism trade for alternative employment. With the present freeze on construction of large hotels following the carrying capacity study on the islands, it may be difficult for the sheer volume of former Air Seychelles staff to be assimilated into the workforce. Many workers who were laid off when Beachcomber Sainte Anne Resort closed for reconstruction late last year are still unemployed. Prospects are slim and we cannot force Air Seychelles cabin crew to take on jobs they were not trained for and have no passion for. The contract between the Airline and Etihad was the topic on debate in the National Assembly recently. While the Assembly did dedicate some time to pushing political agendas and testing the boundaries of their “absolute privilege” by deliberately making misleading statements, they eventually got to the point and concluded that the redundancy of the Air Seychelles staff would need to go ahead, and that the existing contract with Etihad Holding would need to be maintained. The cabin crew contingent of the airline took to the streets of Victoria after they sought assistance from the Seychelles Labor Union (SLU), which organised their peaceful protest and liaised with the Police on their behalf after a meeting with the Air Seychelles Staff Association. The Airline has now come back with a slightly better offer for redundancy, but the big bone of contention is that they were being paid a base salary that was inferior to what their colleagues on Etihad were earning and are not receiving flying allowances. The Air Seychelles staff are planning a bigger protest in Victoria shortly to emphasise the extent of their discontent, and are counting on the support of the public in this regard. Seychelles has no monopoly laws barring the business community from entering into any line of business. WTO stands against regulations or practices that promote monopoly of any kind, safeguarding the right of any citizen to enter into any line of business he or she chooses. This point has been the subject of discussion for a while and it has again been a topic of debate on the SBC Television recently with the private sector now expected to have their opportunity to explain their side of the equation in the coming week. However, the discussions only seem to be centred on tourism and tourism-related businesses. A clear example of a monopoly would be the overlooked sea cucumber fishery, with only a select few individuals dominating the industry, where a quota system indirectly gives a monopoly to those with a licence for the export market – licences are limited in number and are typically given to the same individuals year after year. The same applies for the coco-de-mer kernel export. The coined descriptive name of “Vertical Integration” does not look at other industries, such as the handling at Port Victoria where a monopoly does exist, nor does it touch the many other businesses who divert into side businesses in a bid to keep their investments on Seychelles soil. In tourism the world over, the strong companies are seen to be diversifying as is the case for the big tour operator TUI’s recent announcement:- “TUI Group becomes the world’s leading provider of services and leisure activities at holiday destinations following the acquisition of Destination Management from Hotelbeds Group”. The solution is to expand the tourism industry. Some small businesses on Praslin are today proposing their very own online booking service which will see them paying commissions to themselves. For this initiative, they will need visibility and an innovative marketing approach. Local Tour Operators, commonly referred to as DMCs, remain the partners of the Tourism Board at Tourism Trade Fairs or promotional workshops. Some hotels join in depending on whether the event is taking place in their source market of choice. These hotels have, and continue to enjoy, a very high occupancy level and command a better average room rate because they are known, they are relevant and are today sought after. Some DMCs work on specific tourism markets based on their field of experience and are working. Freezing the local Tour Operators will bring in a freeze on the marketing dollars and the country will need to fork out. Businesses should to be actively showcasing their services or products and finding clients, rather than waiting for clients to turn up on their doorstep. With looming regulations pertaining to Vertical Integration, which will affect the management of tourists disembarking cruise ships in Seychelles, we must encourage the incoming tourists to purchase excursion packages and entice visitors to spend money on our shores. Statistics reveal that just under 50% of cruise ship passengers do not buy a ship organised excursion when entering Seychelles. The shore excursions that are presold on board the vessel have to be what was offered when contracting with the Cruise ship Operator and with the requested insurance policies based on international norms in place. Here again, the work must be to entice the 50% odd percentage of the passengers who remain on deck, or those who just take a walk to town to look at alternatives, to invest in a local excursion package. The business is here, but we are not tapping into it. The Seychelles Taxi Association is making attempts to access cruise ships and to offer the services of their members as licensed operators to the passengers sitting on board. They will be working through the Vanilla Islands body. Cruise ships earn their commission on excursions that are presold, but are open to initiatives that will enhance the Seychelles experience for their passengers, especially if this is at no cost to them. We need initiative and foresight to grow our business. First Seychelles worked to increase number of cruise ships coming to Port Victoria, and now need to maximise benefits for the country from these stops. Seychelles, Mauritius and many mainland African Countries were parading on the Gold Coast of Australia for the opening of the Commonwealth Games 2018. Seychellois were proud to see their Nation’s flag aired on television and featured on this important global platform. A new small business offering the rental of clear glass kayaks is receiving positive feedback from visitors, but the dirty swamp-like muddy water clouding a portion of the sea at Source D’Argent is affecting the experiences of tourists and locals who use the clear kayaks around the area. Thousands of visitors pay an entrance fee to visit L’Union Estate to get to the world famous Anse Source D’Argent on La Digue Island. Encouraging small Seychellois owned businesses to tap into the market is the way to go, BUT we need to get our house in order at the same time. Visitors have sent in comments to air their disappointment and concern that muddy coloured water flows continuously into the ocean just next to the small beach restaurant at Source D’Argent. The reason for the dirty water and the intensity of the dark colouring is for the Authorities to look into, but the option for L’Union Estate to take action in the interim is open for those concerned with the possible impact this is having on the environment and on the La Digue tourism. People of Seychelles. It is your duty to save environment’s beauty ! This Assumption Island saga for the construction of a military base seems to be far from over. The project and the new negotiations are managed in secrecy when the Seychellois People have a right to know. Seychelles is caught in a saga it did not need. In his first Press Conference since assuming office, Vice President Meriton addressed the rising feeling of xenophobia, a departure from the Melting Pot of Cultures tag line the islands were boasting for many years. Seychelles needs to embrace its “friends of all and enemy to none” policy and enshrine this as the Foreign Affairs leading principle instead of playing one against the other. We are too small and any side we take will have adverse consequences for our UNESCO World Heritage Site of Aldabra. This has been one cause that has rallied the people of Seychelles to be ONE and no amount of lobbying will deter the determination now in place to defend the sovereignty of Seychelles and the pristine environment of the islands. 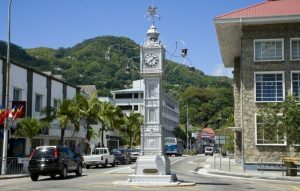 One of the most iconic historical features of Seychelles, the Victoria clock tower, is 115 years this year. It was on April 1 in 1903 that the clock tower was installed in the centre of Victoria, the capital of the island nation. A landmark dating back to the colonial era, the clock tower was erected in memory of Queen Victoria, who died in 1901. The clock tower, which back then cost around $468 — about $12,300 in today’s dollars — was made of cast iron by Gillet & Johnson, a clockmaker and bell foundry based in Croydon, England. These were known as “Little Big Bens” because of their similarity to the clock tower of the Houses of Parliament in London. Only four months after it was erected, on August 13, Seychelles – a group of 115 islands in the western Indian Ocean – was separated from Mauritius to be governed as an independent crown colony. In that same year, Ernest Bickham Sweet Escott was sworn in as the colony’s first Governor.